Clare’s professional name was Mullens. She was a freelance fashion designer and illustrator, specialising in suede and leather, fur and sheepskin, designing collections for companies in Italy, Germany, Israel as well as England. She was twice selected by the Leather Institute to represent Britain in Paris. Some collections were marketed under her own label. She went to the Hornsey College of Art and later taught at the London College of Fashion and the Croydon College of Art. 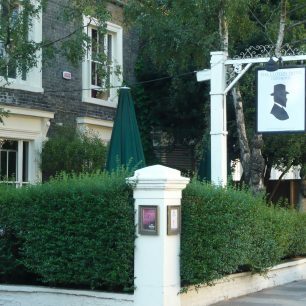 She came to St John’s Wood, 90 Clifton Hill, (which is two doors from the pub) in 1966. 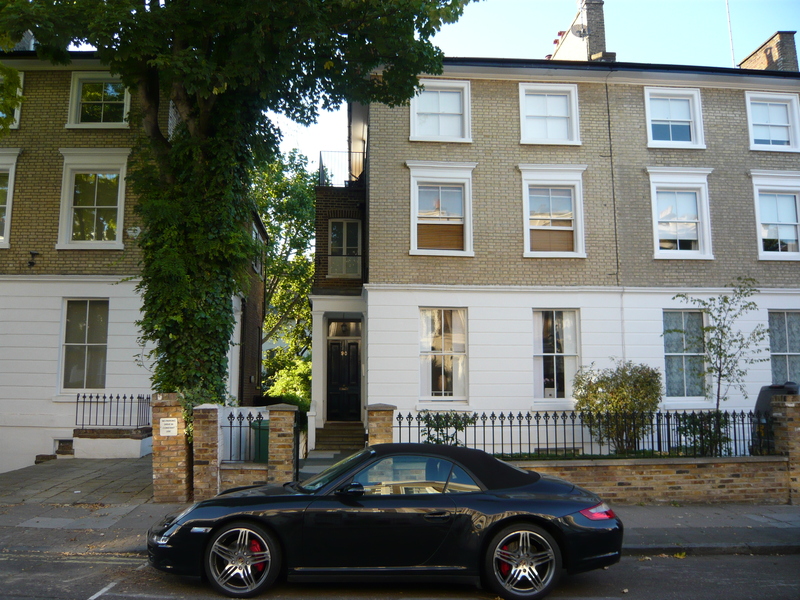 She found this in a hurry as she only had a weeks notice to leave her other flat in Kensington. She had one room. The kitchen and bathroom were combined, with a board over the bath. There was a large gas water heater, a Baby Belling, with an oven and grill. The basin was both for washing and washing up. The toilet was down the corridor and shared with another tenant. She was supplied with a small fridge and a television. There was no heating, the fireplace was boarded up, so Clare used a paraffin heater. Electricity needed money in the meter. The back windows gave onto Belgrave Road, with a view from the tiny terrace. Clare’s boyfriend had the room next door. Mrs Schafrenak, a milliner, who always designed feather hats, lived on the ground floor. Mrs Rennell owned the premises and she lived in Marlborough Place. Half way down Clifton Hill was a film studio run by John Stewart and his partner Vernon Grieves, who employed 12 people. They made promotional films for the Ministry of Defence, the Foreign Office, the Royal Navy, Help the Aged, Marconi etc. They were there from 1967 to 1973. The Clifton pub was run in the 1960s by Frank and his son Mike. It was painted brown and was sticky from all the smoke. They had table football and darts there. Clare did sometimes go to the Heroes of Alma, where they sold cheap cider. 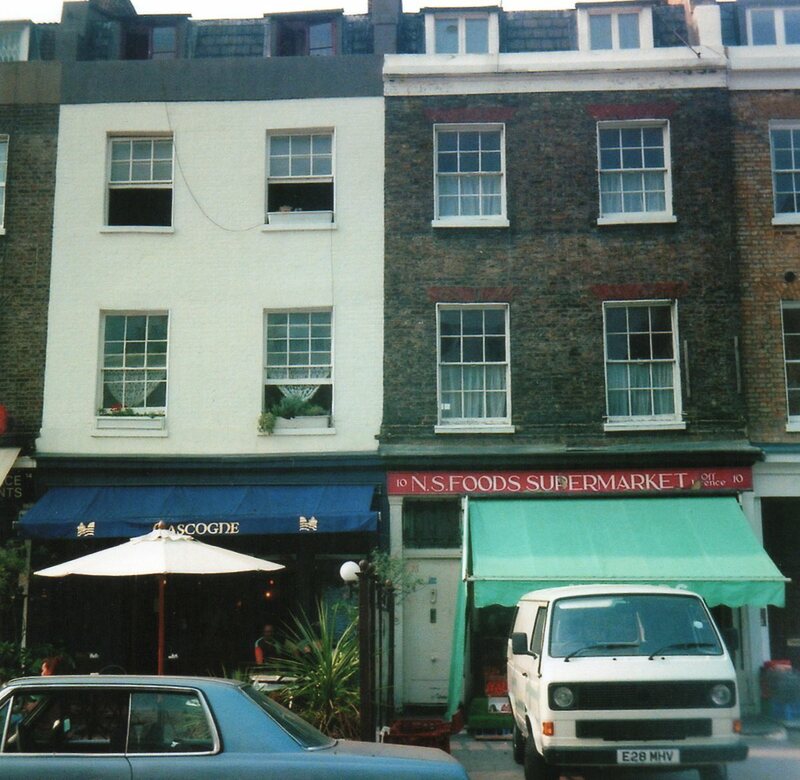 Jack’s Café in Belgrave Road was a greasy spoon café. Clare heard about another rental possibility in Blenheim Terrace, three floors above the Village Bakery, opposite where L’Aventure is now. She dressed up in white leather, her own design, added a hat, and went to the estate office of Mr Charles Jellinek. He had bought up lots of properties very cheaply during the war, mainly bedsits or flats to let. He was charming, and also immaculately dressed. 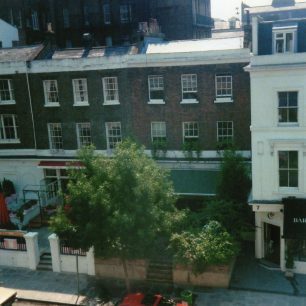 He gave them two leases for Blenheim Road, the two top floors for Clare and the other one for her boyfriend, Luciano Koch. He was a window dresser, an inventor, and exhibition and shop designer, and a Swiss jazz singer. Very sadly he was later killed in a motor accident going to Cambridge. 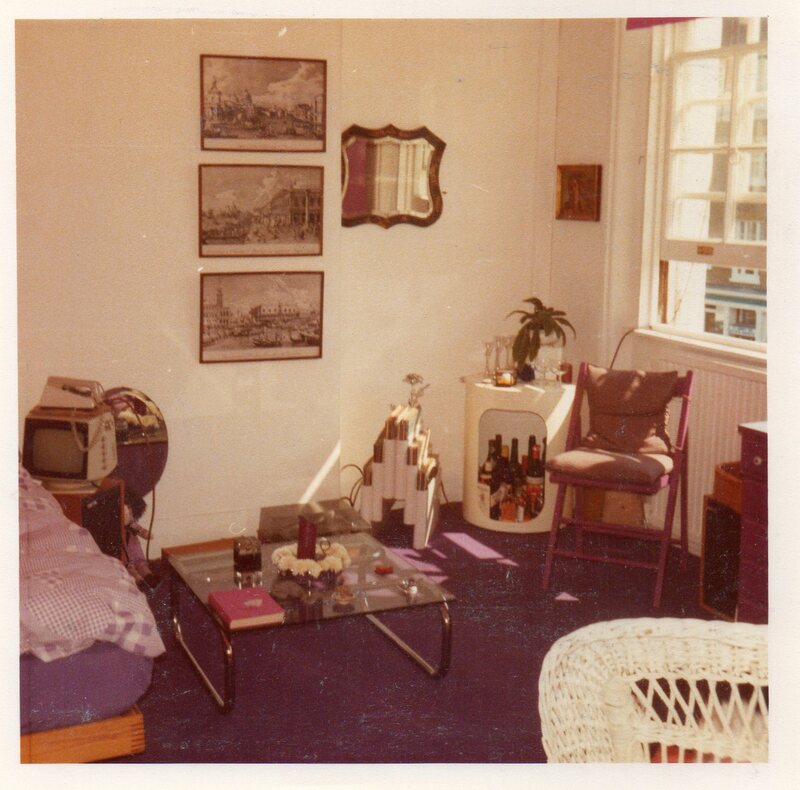 They moved into 10 Blenheim Terrace in 1970. It was all dark, dark turquoise walls and dark panelling, with six layers of wallpaper. There were three tiny rooms on the top floor, with fireplaces in every room. These Mr Jellinek removed and also knocked down the walls to make one big room. Clare bought expensive wallpaper from Osborne and Little (but it lasted for 20 years). They made the kitchen royal blue and white, with yellow accessories. They had a gas boiler – and double glazing, so it was warm! This had been installed by the landlord, who also gave them an extra wash hand basin on the top floor to wash out paint brushes. They had a bathroom on the mezzanine floor, and a terrace (which they floored with artificial grass) which looked onto the gardens of the old people’s home. Later, flats were built there. They had a kitchen and a big sitting room on the first floor, and bedrooms on the second. When they bought the “Tricity” double oven from Heals, the shop lent them another oven till their own could be delivered. And when they ordered a “Relyon” studio bed, Heals also supplied two fold up beds. From Habitat they bought “Kartel” ranges of plastic storage units and round or square tables which could be added to at will. Paint colours were bright and cheerful, from “John Oliver”, Pembridge Road, Notting Hill Gate in fuchsia, cobalt blue, and pimento for the various rooms. Modern swivel chairs were bought, spot lights installed and an entry phone on each level. Candle holders were by “Rosenthal”, and German yellow enamel saucepans from Germany were supplied by Fairfax kitchen shop, Swiss Cottage. 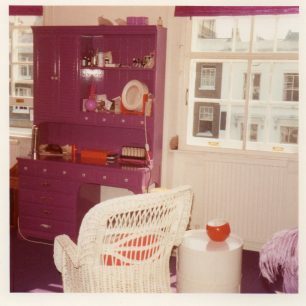 Fitted cupboards were made for the whole of one wall in the top floor studio with china red knobs from “Knobs and Knockers” in Judd Street, and purple ones for the bedroom. Clare made curtains and hangings and bedcovers in the same bright colours with fabric from “Hull Traders”. Fuchsia blankets came from Maples. Plexiglass “Plia” transparent chairs came from Italy. They had a “Trim” phone. Everything was the latest modern design. Charles Jellinek was very fair, he asked Clare what rent she could afford. He often let to young artists and musicians who perhaps did not have regular incomes. He had an adopted daughter, and a granddaughter who was a model when young. She married a builder. 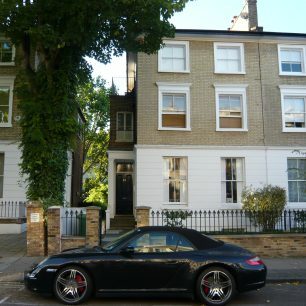 His granddaughter still lives in St John’s Wood. Charles lived in Blenheim Road and had a house in Surrey. He loyally kept on all his maintenance staff, and Clare remembers Ron the plumber. St John’s Wood was quiet and dull, everyone was behind doors by 7 pm. There were Jewish, German, Austrian, Hungarians in the area. Cosmo restaurant in theFinchley Road catered for this community, it was another world. Clare shopped in Kilburn or Swiss Cottage. Sainsburys closed at 4 pm on Saturdays. There were shops in Boundary Road where Clare used the launderette. She remembers Hodges the chemist, a co-op and a newsagents run by Italians, and an Italian greengrocer. There was a butcher in Abbey Road. 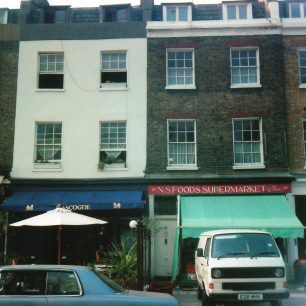 In Blenheim Terrace, before L’Aventure, was a restaurant called Abbotts, run by a German. The wine shop, Bradys, sold tinned foods as well. This was open till 6pm! The hairdresser, Mr Rowe at Maison Rowe was a character. He did hair for lots of elderly ladies with rollers. His wife was very thin and liked her gin. He had come from an orphanage in Norfolk and been sent to France to learn hairdressing at the age of 16. Mr Rowe shared a love of cats with Clare and had a white Persian cat. After his wife died, Mr Rowe would always come to Christmas lunch with Clare. Kitty a neighbour, lived above one of the shops and would cook lunch for Mr Rowe every day. A lot of people were very kind. A gentleman butler lived in the street. 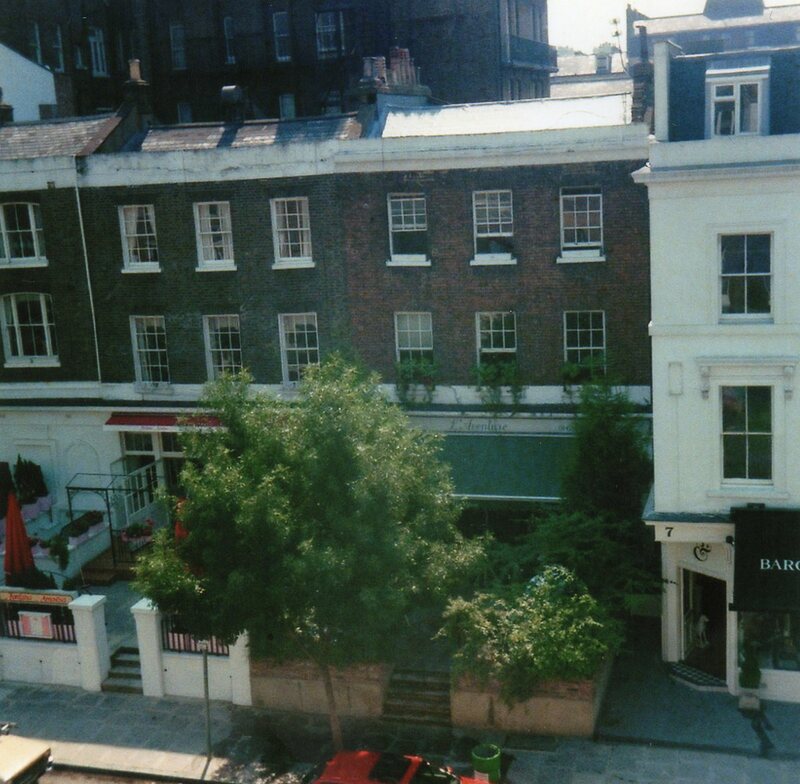 The Drum and Monkey pub was on the corner of Ryders Terrace. Clare used to go to the cinema quite a lot, to the Everyman in Hampstead, the art cinema the Bijoux in Edgware Road and to Swiss Cottage. The swimming pool there was very run down and dirty. She went to the Catholic chapel in St John and Elizabeth hospital. The chapel was rebuilt, brick by brick, as it had been at Great Ormond Street, and they wanted to expand the hospital there so the chapel had to be moved. One Christmas Clare fractured her ankle falling on her staircase, (wearing her Biba platform boots). She got a free X-ray. The St John and Elizabeth hospital was awful, dark with big wards. The nurses/nuns wore habits and big headdresses. 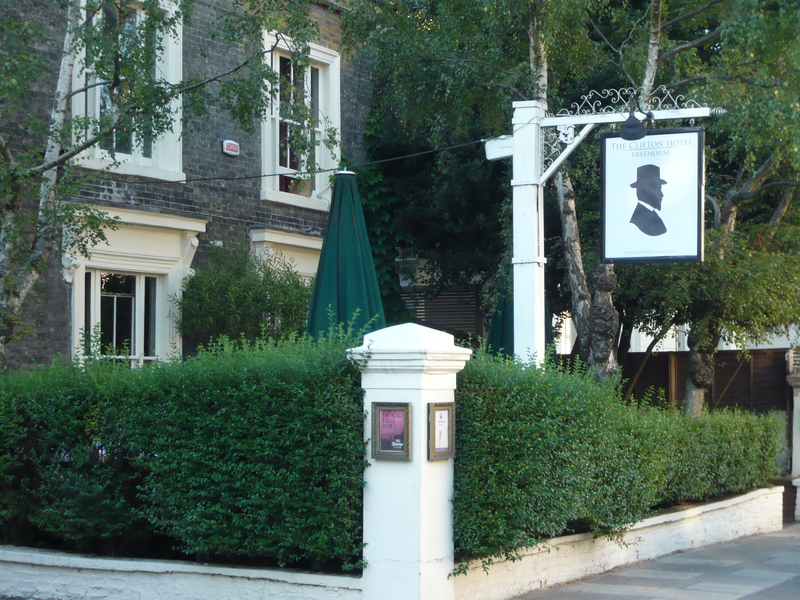 There were very few black people in St John’s Wood. Then the Indians arrived from East Africa and ran the shops. Their families lived above, so they were open late. They were well educated. In the High Street Harry Morgan’s was run by the same people, Mrs Morgan and her sister Mrs Konic, both immaculately dressed. Mrs Philpot, the owner of the hardware shop, campaigned for keeping up the cab shelter. There are now no practical shops in the High Street. More trees were planted in the streets in 1978 and flower baskets too. They have been looked after well. In the 1960s and 70s the population here were mainly mature men and women, many from Austria and Germany, with many Jews among them, having settled here after the war. Now there are many more children and the community is more cosmopolitan. The French, Japanese, and Americans all have schools here, and there are people from the Middle East and Eastern Europe.